Ok, si, we never were the typical familia. BB raised her trio to believe in themselves and in what they were doing, to love what they were doing- or at the very least, to find something to love in what they were doing.﻿ In all instances do things with heart, from the heart, and always- with gusto & passion! Another lesson I tried to stress was the importance of homemade gifts. Que? Does that mean BB would turn down cash or a Starbucks GC? JU SO FONII!!! What better complement to a homemade card than having one of those tucked inside? Seriously though, and once again, presents with heart, from the heart. And so my son, knowing that BB loves twofers (that's two things for the price of one) was going to give me a peek at what he was doing, a tour of his latest job, the Port of Miami Tunnel, and the greatest homemade gift a child can give to their mother- time together. Naturally Babushka was thrilled when Marine MAC, that's one of the nicknames I have for my son, called to inform me that although he had to work on Madre's Day, he wanted to spend some time together and would pick me up. He wanted to give me a behind the scenes look of the news making tunnel. Oh Joy! At 5:30 a.m. Oh. Joy. At the port the tour begins. With camera and fan in hand, hard hat in place and visitor tag on lapel, BB tries to keep up. Being my son, and a military man, my son knows only two ways to speak. Either he's detailed and extensive, or short and to the point. Extremes Are Excellent. Thankfully he started off detailed, but once Mr. Sun started to heat the air and he saw BB's fan a fury MAC knew it was time to switch to monosyllables, just naming the parts of the equipment. The following pictures were not the only pictures taken during the tour, but being 5:30 a.m.,a mom, and non mechanically inclined, these are the photos most important to Babushka. Escorting me to the end of the tunnel, my son said he loved me- with heart, from the heart. I couldn't have asked for a better Madre's Day. P.S. When BB started the blog MM didn't want his pic showing, for this post he said yes. Another gift from my boy. Handsome devil isn't he? P.P.P.S. Later in the evening, MM's sons, my grandsons Rinquincaya and PicaPica, and my DIL came by with dinner for me and La Tata. Oh si, one of my best Mother's Day ever. OJO There may affiliate Links in this post, 'cause BB's gotta have her cafe. Sols! My Beastie!! You have no idea how much it means to BB to see you here;thank you so much for your words. And what words- beautiful, just like you. TQM y me quedo corta. Great story! One can feel the love between the lines...MM is soo handsome! Congrats BB! Thank you, thank you, and thank you. And I totally agree w/you. Gracias for your sweet comment. Wow! How cool you got to go inside the tunnel! And with the bestest tour guide EVER!!!! He did come out ok didn't he? I guess ::shudder:: puberty and the silver lifelites were worth it. Thank you for coming by once again. Dear BB! I hope you had a very cute MOTHER'S DAY! your always so adorable & I love your story, good experience, I see that your child adores you. Thank you querida, yes I had a great day and I guess he does ♥ his ma. But then, you know all about a child's love don't you? Hope your Dia de las Madres was wonderful too. What a wonderful day! Sounds like you have a beautiful family. Marissa, mucho muahs!! It was a very wonderful day and my family are beautiful thank you. Hope your Madre's Day was wonderful too. P.S. How's your finger healing? Speedy recovery mija. Thank you mujer, post sweet... and sweat- believe me! ; ) Gracias por el comentario. What a beautiful story, BB. 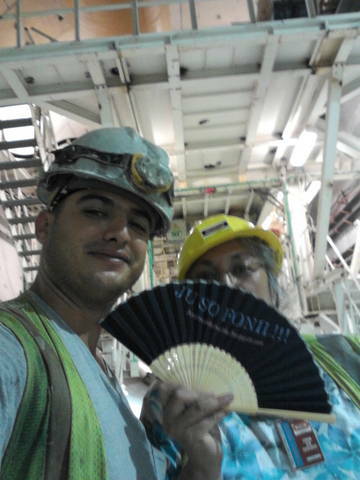 The fan and the hard hat are classic. I'm glad you got to spend special time with your mijito. It definitely was a special time w/MM and I hope you got to spend time w/your special loved ones also. Thanks for your thoughts y BB2U.